Every once in a while the ideal band combination comes around, and that moment has graced So Cal once again. On May 8th, The New Limb will be warming up the stage for headliners Minus the Bear, and it will be a match made in catchy-guitar-riff heaven! Comprised of five musicians based out of California, The New Limb is kind of like an indie folk child if that child ran off and had a wonderfully adventurous affair with a rock star. With just the right amount of upbeat velocity and driving drum beats, coupled with an occasional penchant for electric riffs, this group creates one of those “sounds of the summer” — their mix tape INCONSISTENCIES boasts the kind of songs that can go on dance floors and on road trip playlists, alike. Most of the band members take turns tossing around vocals, seamlessly melding their voices in a chant one moment, or crooning over keyboards and tambourines in the next. They’re quickly becoming a new favorite, and their sound is the perfect complement to Seattle-based Minus the Bear. Definitely not new to the indie music scene, Minus the Bear has managed to amass a bit of a cult following, based partly on their unique sense of musicality, syncopated guitar melodies, and of course, lead singer Jake Snider’s famous affinity for serenading baby-making lyrics. But don’t let the sultry subject matter fool you — in the long haul, Minus the Bear is ready to get you on your feet and dancing, keeping the dynamics fun enough for a party, but mellow enough to simply enjoy the beautiful composition of it all. 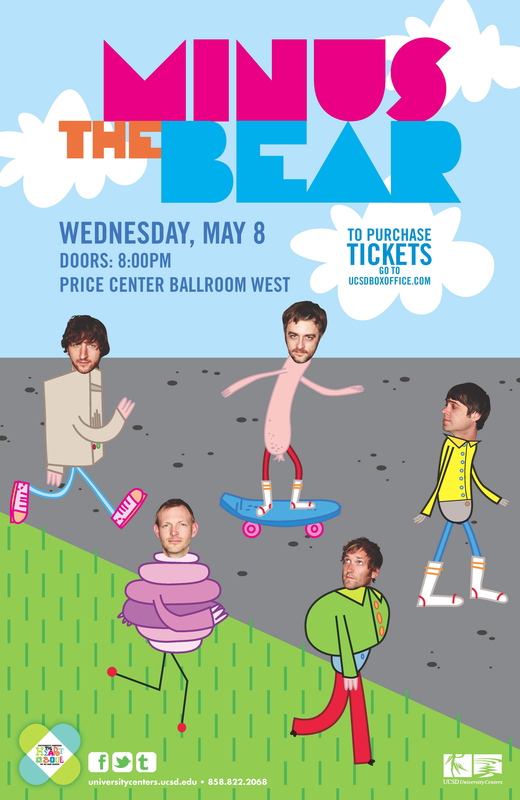 You can check out both bands live on May 8th at the UCSD Price Center Ballroom, the biggest indoor venue on the campus. Tickets are available at the UCSD Price Center Box Office, and online at https://ucsdboxoffice.com/.